Just recently, Skytrax rated Singapore Changi as the World’s Best Airport, for the third year running. Changi Airport celebrated further success at the Awards, unsurprisingly receiving the award as ‘Best Airport for Leisure Amenities’. These leisure amenities include music bar lounges, cinemas, a music deck, swimming pool, napping and rest areas and the in-terminal Transit Hotel. 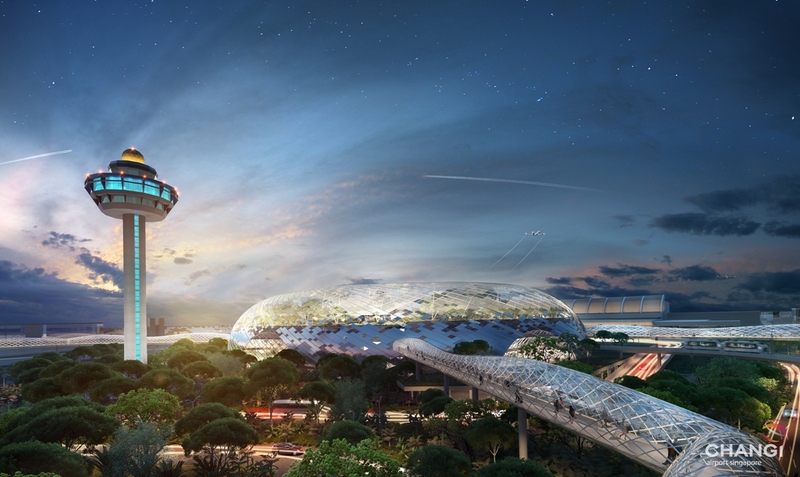 At the heart of Changi Airport’s future plans is their Avatar-style ‘Jewel’ project, offering one of the most innovative passenger experiences seen on the ground. 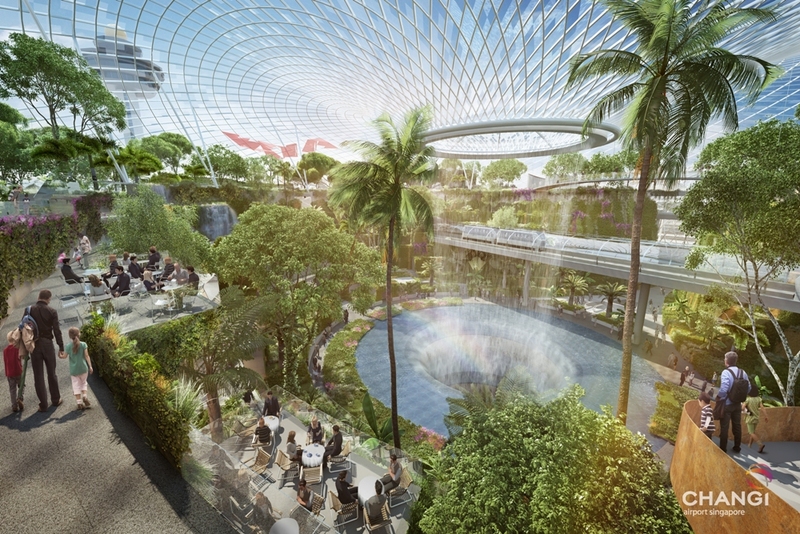 Announced late last year, Jewel’s footprint will sit on Changi’s current Terminal 1 carpark, which will be rehomed underground, to allow for the most adventurous building project in Changi to date. 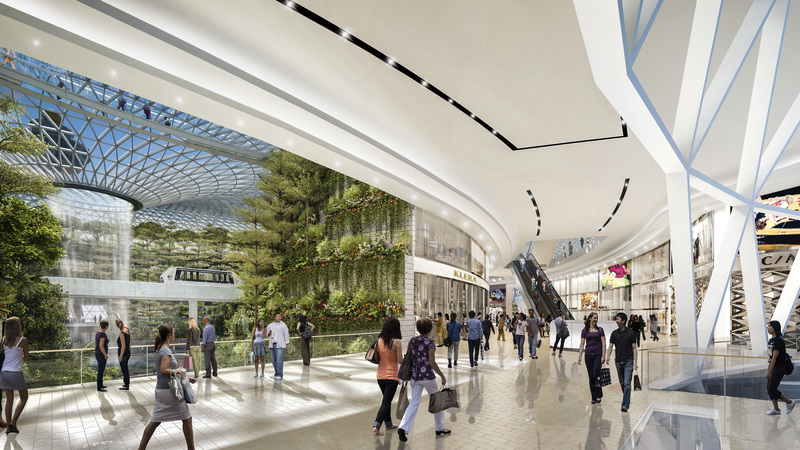 Strategically located in the heart of the airport connecting the current T1,T2 and T3, Jewel is envisaged to be a world-class lifestyle destination that will increase the appeal of Changi Airport as a stopover point for travellers. As passenger traffic increases, there is a need for Changi Airport Group (CAG) to expand their T1’s handling capacity, to uphold the passenger experience, as well as provide further room for airlines’ growth at the terminal. With the redevelopment of the open-air car park, CAG will extend the footprint of the terminal building into the space of the site, adding more than 70% to the floor area of the arrival and baggage claim halls. Whilst most airports destroy older terminals, Singapore is embracing their current operational terminals, and making sure they reflect a 21st Century passenger experience. 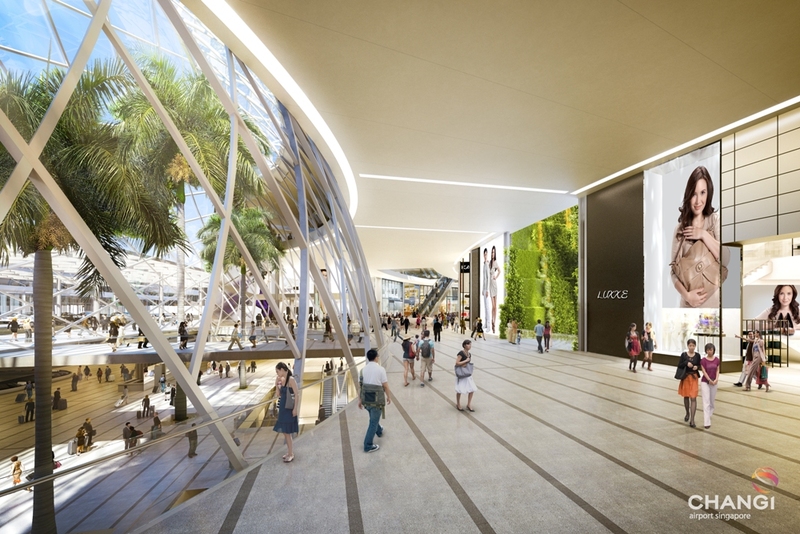 Combining Terminal 1 into the new Jewel project is key. The expanded T1 Arrival Hall will be seamlessly integrated with Level 1 of Jewel while the Baggage Claim Hall will also see more circulation space and the installation of additional baggage belts, operated by an upgraded baggage handling system. At the T1 Departure Hall, a revamp of the check-in counters will take place, with the incorporation of self-service kiosks. This will improve efficiency as well as optimise the space available. This isn’t just about good aesthetics, reinforcing good design addresses the needs of the user, improved ground transport facilities will be developed for T1 to cater to increasing visitors. A second departure drop-off bay will be constructed, doubling the number of vehicular lanes for drivers to drop off passengers. The length of the arrival pick-up bay will also be extended by 50%. It doesn’t stop there, and even though Terminal 4 is still finding its feet, Terminal 5 is already in planning stage – with further details just about to be released. 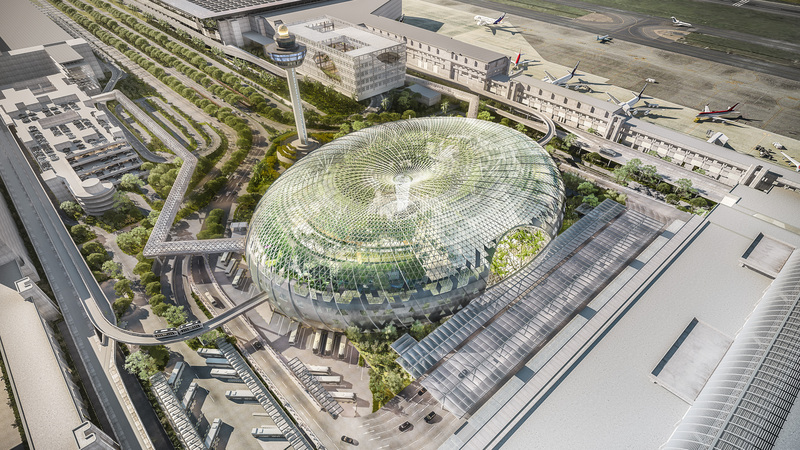 Whilst the new terminal was announced some time back, Changi has recently announced grander ambitions for T5, which will be constructed after assessing the success of T4. The new terminal, with a footprint and passenger volume greater than the combined T1,T2 and T3, will allow a further 50m-70m annual passengers, making Changi more impressive than competing Asean hubs also all touting similar expansion plans. Expected to open in 2020, the new terminal will feature connections to the other terminals, it’s own MRT station, and also involve the building of a new runway, to support the increase in passenger figures. 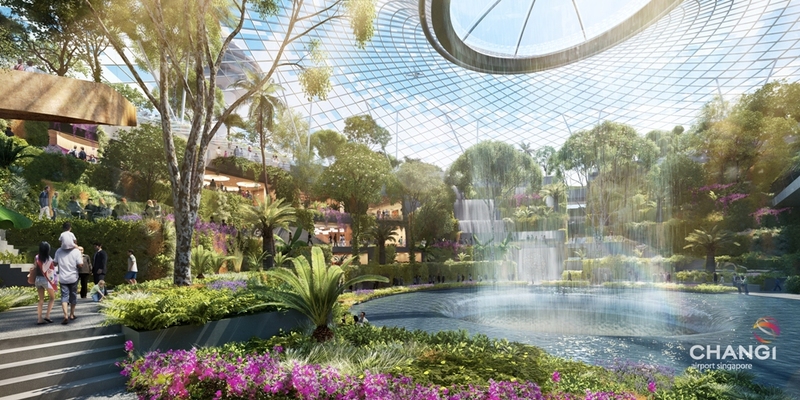 In 2018, when the Jewel project is completed, and in just five years time when Terminal 5 is also expected to open, Singapore Changi will be one of the most talked about airports of all time, and one thing is for sure, we LOVE this airports quest for offering the most unique, and aesthetically breathtaking passenger experience in the world. This is fantastic. Its all about pushing boundaries and obviously Changi does that in spades. Take note other world airports..